The Boho styled tribal wedding concept is a very beautiful theme. This theme allows you to work with natural elements such as flowers, tribal-inspired décors like arrows and feathers and unique looking centerpieces. When you are considering this inspirational idea, you can decorate the entire venue in a modern yet traditional approach. Paying attention to small details will help your theme look more natural. No doubt, you may have to work a little hard to get some good stuff, however, this will not be difficult since you have a variety of websites that sell Boho inspired tribal wedding decorations. Instead of getting married in a regular practice, you can create your own wedding aisle with this innovative idea. For this, you will need to choose a location, which has an enclosure or a pathway that is covered with leaves. Place a few benches for people to sit on, and decorate each of them with some White colored flowers. For the alter, you can consider having beautiful real flower streamers along with elements like feathers of different colors. This will add to the real feel of having a tribal-inspired wedding theme. If you are considering an outdoor wedding venue, then having signboards is very important. Instead of going for the regular ones, you can consider having wooden based boards. Use arrows that are inspired by the tribal concept and blend that in with the areas that you want to highlight. For example, you can have multiple boards on one stand, which shows people where they need to go if they want to visit the Restroom, dining area or the place where you plan to have the ceremony. 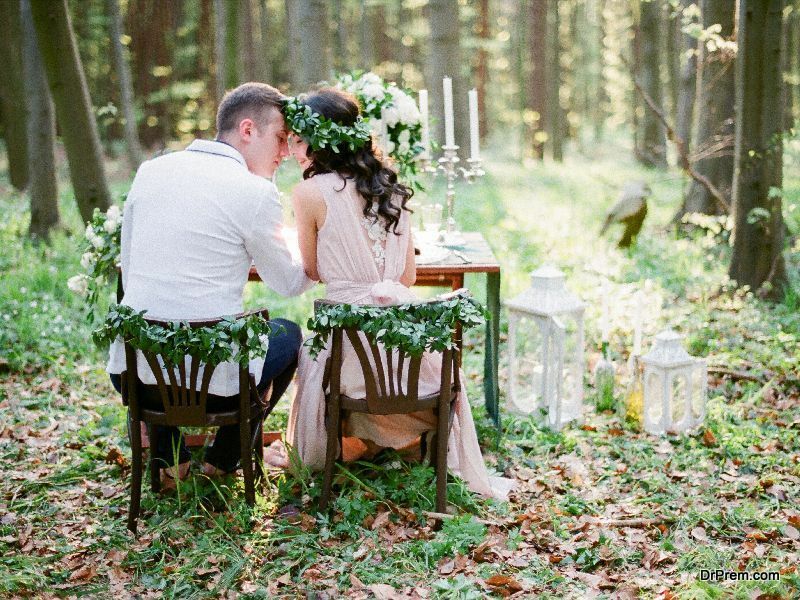 After you exchange your I Do’s, you can create a tribal-inspired space by decorating it with natural elements. In this location, you can use the help of an authentic tribal-inspired and designed rug or carpet to stand on. Just close to it, you can choose to have a variety of decorations using feathers, arrows, and other such tribal inspired wedding décor. If you want, you can also have a traditional bonfire to make your photo shoot more interesting. The good thing about this idea is that you can have it easily indoors as well as outdoors. For your wedding reception venue, you can consider having a very subtle and simple tribal inspired theme. Candles, floral centerpieces, subtle colors, crystal dinner sets are some of the elements in this idea. For the decoration, you can consider it having a nice floral background with flowers like the tulips, roses and a touch of wildflowers. If you are looking at specific décor ideas for your dining table, you can consider having nice long tables instead of small ones to fit your entire family on one table. In the center, have different colored glass bottles with small bunch of flowers and candles. Go with a colored glassware and dinner set and silverware. This will be a perfect way for both the families to bond together. Another idea on this front is to go with a tribal-inspired lace design on a simple wooden table decorated with silver candle stands, broad candles, and flowers. To maintain the vintage and elegant look along with the tribal concept; you can consider having a few tribal inspired centerpieces on the center and sides of each table. For the food table, you can go with natural elements like floral based food decorations along with tribal-inspired cuisine. Blend in small elements like arrow skewers, feather deigned food picks and other such small factors.